The patented Hot Bolting Clamp™ ensures that the gasket stress is maintained even if all flange bolts are simultaneously removed. The Hot Bolting Clamp™ is equipped with a system to counteract the pretension of the tool. This enables a fast and appropriate installation of the clamp without any risk of gasket crushing. 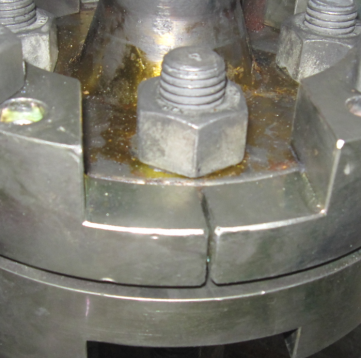 Our experience is that a two-person team can renew the bolting on up to 20 flange connections per working shift. Statoil/Equinor qualified and included in TR3016. Each unique Hot Bolting Clamp™ is pressure tested to 1.5 x the flange rating on test flanges with all flange bolts removed. For a typical CL1500 flange the test pressure is 380bar (5600psi). Burst testing of a 1.1/2″ CL600 Hot Bolting Clamp was stopped at 540barg (7000psi) without any leakage or visual clamp deformation. This is 5,1 times the maximum rating pressure for CL600. Click here to learn more about the design basis for the Hot Bolting Clamp™.